Anyone can get a guide book and a map and walk around a strange city. The problem with this approach is that you are bound to miss something truly amazing and those guide books are only as good as the person who wrote them and how well they did their research. Sometimes it is best to hire a guide to learn the secrets of a place that only a local would know. 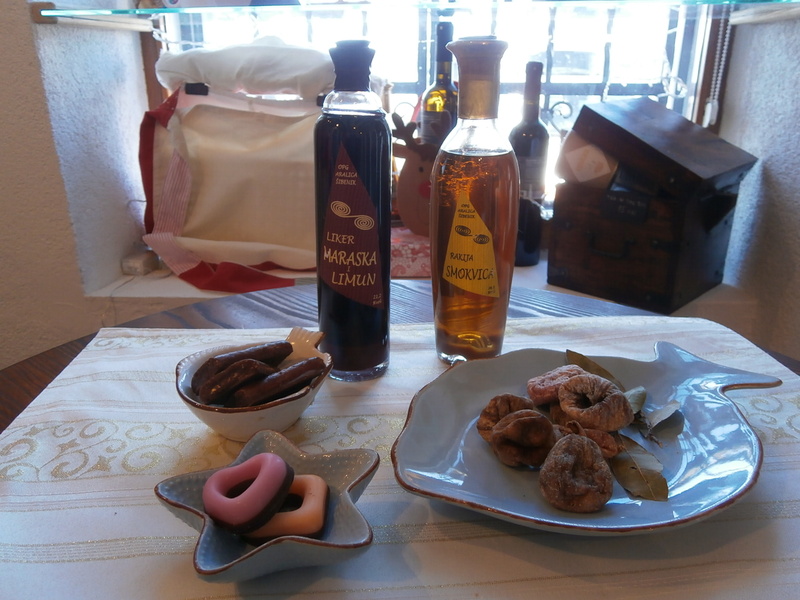 On a beautiful winter day recently we did just this walking around the city of Sibenik with Tina Vickov, owner of Sibenik Plus Tourism Agency and Tina Bilus (a licensed guide for Sibenik County) who gave us some of the inside scoop on the city we have been calling home. What we found out was that even after being here for several months we had more to learn. 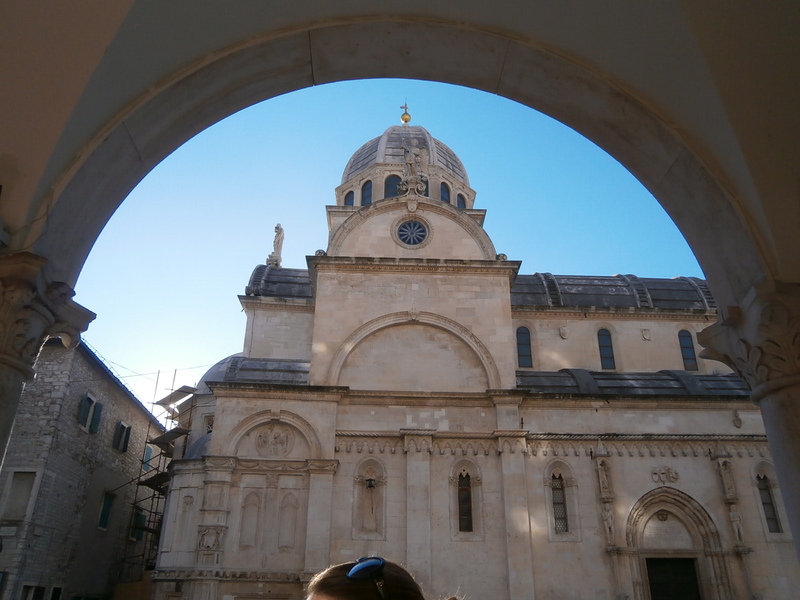 The most famous landmark of Sibenik is the Cathedral of St. James (Sr. Jakov) that sits at the top of a staircase and affords a spectacular view of the waterfront. On a bright and sunny day this view cannot be beat. One of the greatest lies told about the Cathedral by tour guides who do not really know this city is that the bell tower where you hear the bells chiming from can no longer be seen. In actuality there never was a bell tower and the bells you hear ringing on the hour are from a CD that plays over a loud speaker. What is true however is that the Cathedral made it onto the UNESCO World Heritage site because of two special factors. One is in its construction. There is not one nail, stud or other device holding the structure together. There is also no plaster or glue or cement used to hold the cathedral together. 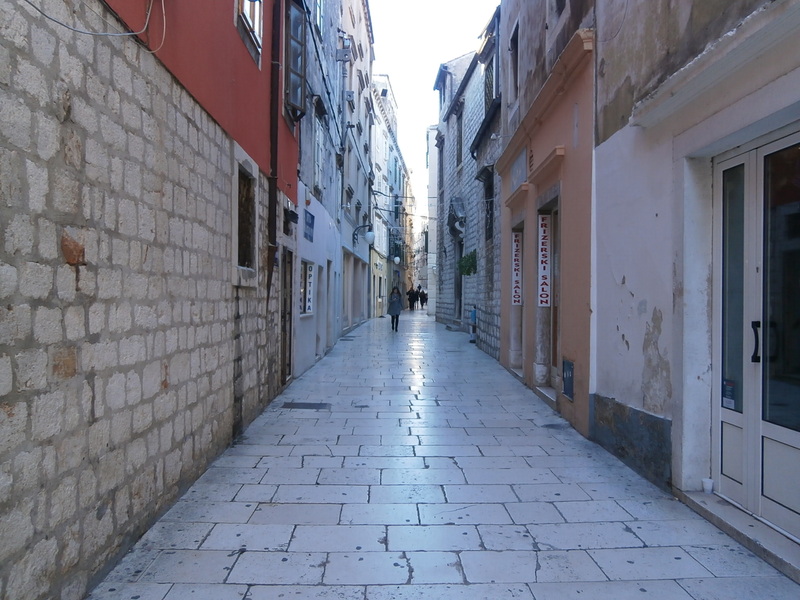 The stones used were carved by artisans in Split and then assembled here. These pieces are interlocking and so tight that you couldn’t slip a piece of paper between the blocks. It is an amazing architectural achievement considering the Cathedral was built in the early 14th Century. The other unique feature of this church is found on the outside. 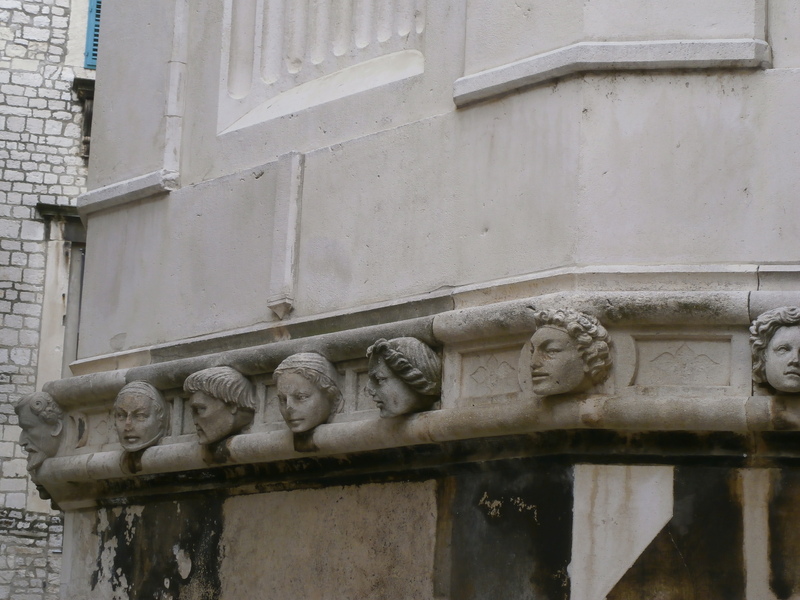 There are 75 ‘faces’ along the back arch. 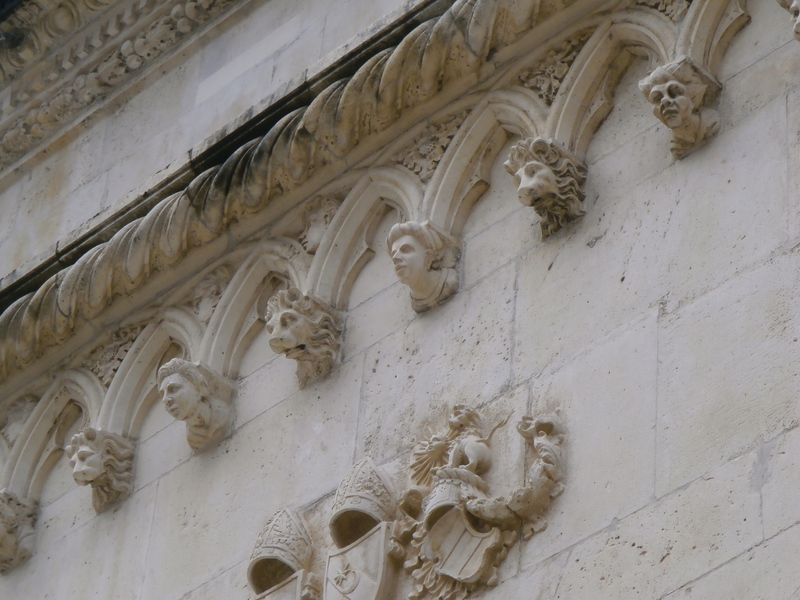 What makes these faces unique is that they are carvings of local citizens of the town of Sibenik from that time period and not royalty or wealthy patrons of the arts. 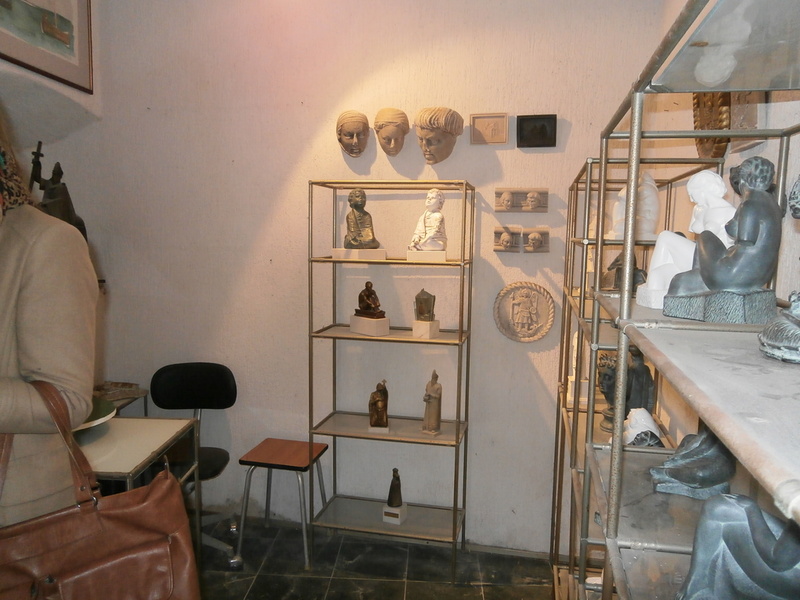 It was the first example of sculptures of ordinary citizens. What is also unique is that not one of the statues looks at one another, every one is made so that they are looking sideways or ahead or up but never at the looker or at another face on the wall. It is an interesting portrait of what the locals looked like back in the 14th Century. 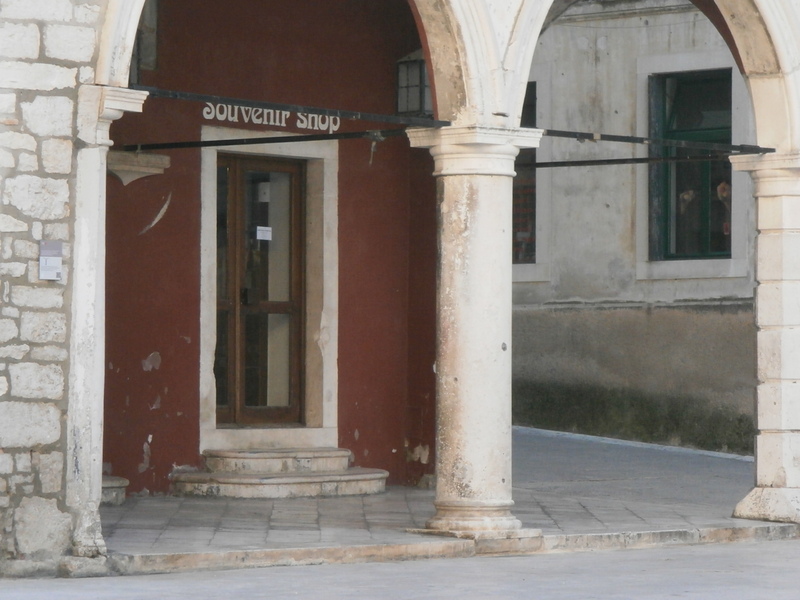 In the same square as the Cathedral is a building with three columns. The middle column is known as the Column of Shame. It was attached to this column that those that broke the law would be bound so that the entire village could see their shame. There are no markings or posters to this affect near the square. 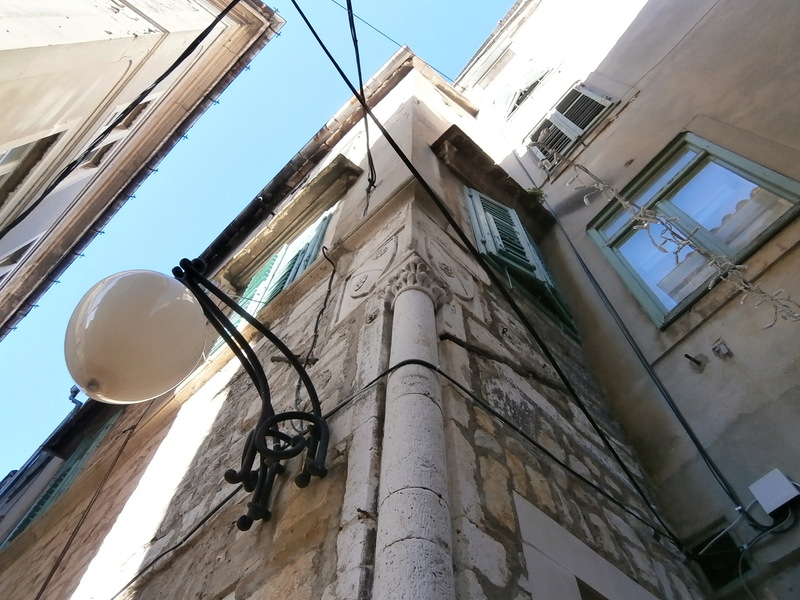 The city of Sibenik was under Roman rule for over 400 years. 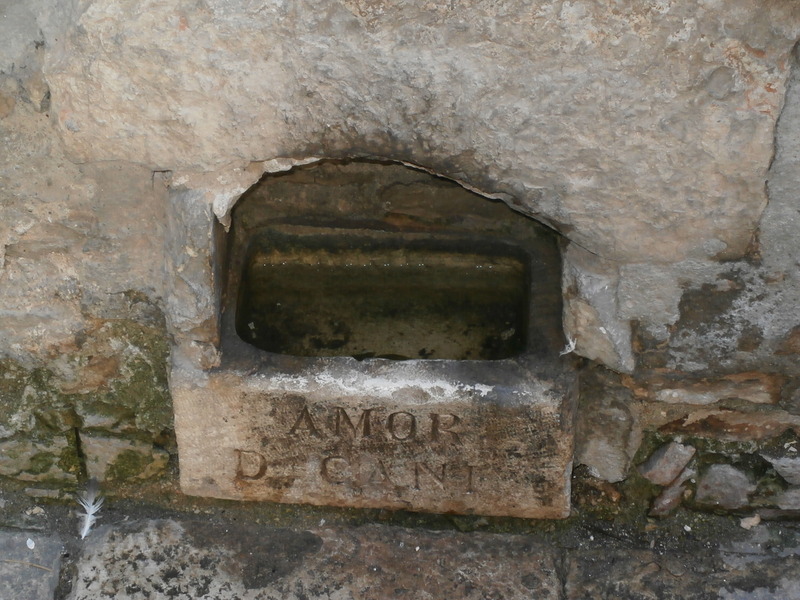 Wandering the streets you come upon this jut out in the wall of one building with the moniker, Amor De Cani (for the love of dogs) and yes, it is a well filled with water for the dogs that run around the city. We have never seen it dry. Not everyone has the luxury of time that we have to spend countless hours learning more about a place and walking the same streets over and over again only to discover something new every time we do so. I get that. But what good is a secret if you don’t tell anyone that secret! I know these are no longer secrets now, which means we’ll just keep walking until we find more secrets…to share.